The headset is a revolving mechanism used to connect the fork, the stem, the handlebar and the front wheel. This part must be easy to turn. Shocks from bumpy road surfaces place a lot of stress on the head set bearings. This can cause the head set to become loose and out of adjustment. The head set should not have any noticeable play. 2. 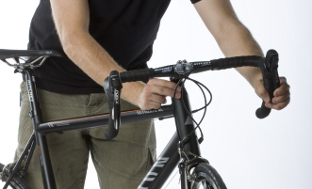 Pull the front brake lever with your other hand and push your Canyon to and fro. 3. If the bearings have excess play, the bearing case will move around on the head tube. 4. Another way of checking for excess play is to lift the front wheel off the ground and then gently drop it. If there really is play you’ll hear a rattling sound. 5. In order to check the smooth operation of the bearings you’ll need to lift the frame with one hand until the front wheel has no contact with the ground. Turn the handlebar from left to right. The front wheel must move smoothly from left to right without sticking. The slightest of touches should be sufficient to move the handlebar, which should then move from left to right under its own weight. In the case of this system a star-fangled-wedge clamps inside the fork steerer. If the wedge presses against the fork steerer tube with too much force then it will be more difficult to turn the fork. If there is too little force, the fork steerer will rattle inside the head tube. 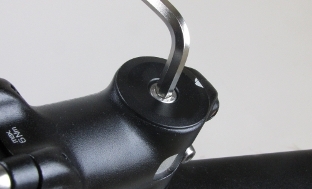 By using the adjusting bolt on the headset cap you can adjust the pressure the star-fangled-wedge exerts on the fork steerer, which also determines bearing play. 3. Straighten the stem so that the handlebar isn’t off at an angle. 4. Tighten the stem bolts to the correct torque again. 5. Now carry out the check for play already explained. The bearings should not be adjusted too tight. Position yourself in front of your Canyon and clamp the front wheel between your legs. Grip the handlebar and try to twist the handlebar. If the handlebar moves, you’ll need to tighten the stem bolts again. 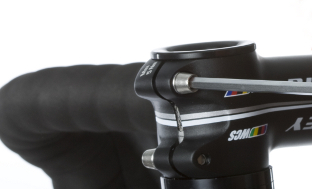 This system does not have any clamp inside the fork steerer. This saves weight and protects the material on the fork steerer. 2. Press down on the stem. Now straighten the handlebar. Look from behind down over the stem and front wheel. Tighten the stem bolts again to the required torque. 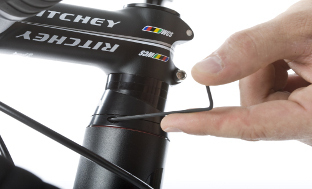 Now all you have to do is tighten the i-Lock grub screw Picture 4 until you feel a light resistance. This reduces the amount of bearing play. When you are done check for excess bearing play again. 3. 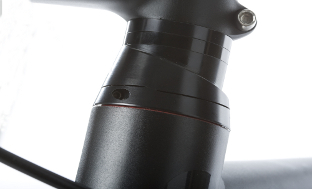 When the headset is correctly adjusted, there’ll be a slight gap between the i-Lock bearing casings visible. Picture 5 When you tighten the grub screw the upper casing slides against the lower one thereby forcing it downwards and this reduces the amount of bearing play. There should be no play around the headset, as the fork bearings could become damaged. Therefore check regularly that there is no play. Check that all screws and bolts have the correct tightening torque. You will find the correct figures on the components themselves, in the Operating Manual or here in the Tech Support Centre.